Results: A team of Pacific Northwest National Laboratory (PNNL) scientists led an intensive month-long field study to research the effects of carbonaceous aerosols, often seen as haze, on climate. The Carbonaceous Aerosols and Radiative Effects Study–or CARES–field campaign examined the evolution and radiative effects of aerosol particles emitted from various sources such as exhaust fumes, wildfires and agricultural burning sources. PNNL's leadership included Dr. Rahul Zaveri as lead scientist, Dr. Beat Schmid handling the aircraft operations, and Dr. Will Shaw running the ground site operations. The research team is now evaluating data gained from the study to improve climate modeling, as part of PNNL's "measurements to models" integrated approach to climate research. Why it matters: Data generated by CARES will help create a better understanding of how urban and natural atmospheric particles impact climate. Aerosols can seed clouds, resulting in more precipitation. They can also absorb sunlight, and warm the atmosphere. CARES data will help scientists model the effects of aerosols and particles for improved future research and enhanced computer models of global climate change. Methods: Near Sacramento, California, researchers took daily ground measurements, flew airplanes with sophisticated sensing equipment, and released weather balloons to sample trace gases and aerosols emitted from the city at various altitudes. The well-defined and regular weather conditions of the region made it the ideal location to better understand how aerosol size, composition, and properties evolve with time and as atmospheric conditions disperse aerosols regionally and at various elevations. According to Zaveri, CARES was designed to help answer questions generated in a 2006 study that measured aerosol and particle disbursement over Mexico City. "Each new field study leads to new questions," he said. "CARES was specifically designed to develop data that will help us understand aerosol evolution in the air and the effect of black carbon particles emitted from vehicle exhaust and biomass burning on the ground." Zaveri shared his experiences during the field campaign through a blog called "Rahul CARES." 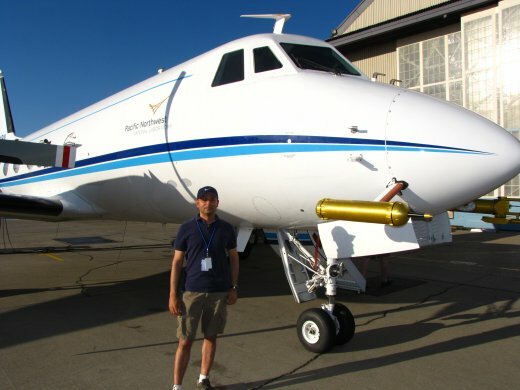 Rahul Zaveri, lead scientist for CARES, stands next to PNNL’s G-1 Aircraft. The aircraft is equipped with a new ultra-high sensitivity aerosol spectrometer, which measures atmospheric aerosol particles. What's next: Future field studies will help researchers better understand the effects of carbonaceous aerosols and their radiative effect in different geographic regions and in different climatic conditions. Acknowledgments: This research is funded by U.S. Department of Energy (DOE) Offices of Science and Biological & Environmental Research, and by the Environmental Molecular Sciences Laboratory, a national scientific user facility located at PNNL. Reference: Zaveri R. May 2010. "CARES: Carbonaceous Aerosol and Radiative Effects Study Science Plan." May 2010. Available online.